Hands up who’s dreaming of a European summer?! A yiros in the Greek Islands after a day of island hopping, getting lost in the back streets of Paris, an Aperol Spritz on a balmy Italian afternoon—there’s just that pesky two-day travel time in getting there. Eugh. What if we told you, that you can book a trip to Europe with Emirates via Flight Centre that gives you the stopover of your life, and makes your travel time all kinds of amazing?! You better believe it people. Get yourself to Europe as a cool, calm and collected person with a stopover in Dubai and more than just a jolty plane nap under your belt. Luxe hotels, camel rides, and rooftop wine bars? Yes please. Sound good? Let’s do this, then. Here’s our list of absolute must dos on your Dubai stopover. A desert safari can be described, simply, as goals. Literally less than a 30-minute drive from the buzz of Dubai’s booming CBD you’ll find the desert. Expect 4x4s, sand boarding (yes! ), quad biking, henna, and of course, camel rides! Not to mention a ridiculously delicious local-style BBQ and a whooole lot of Instagram backdrops. 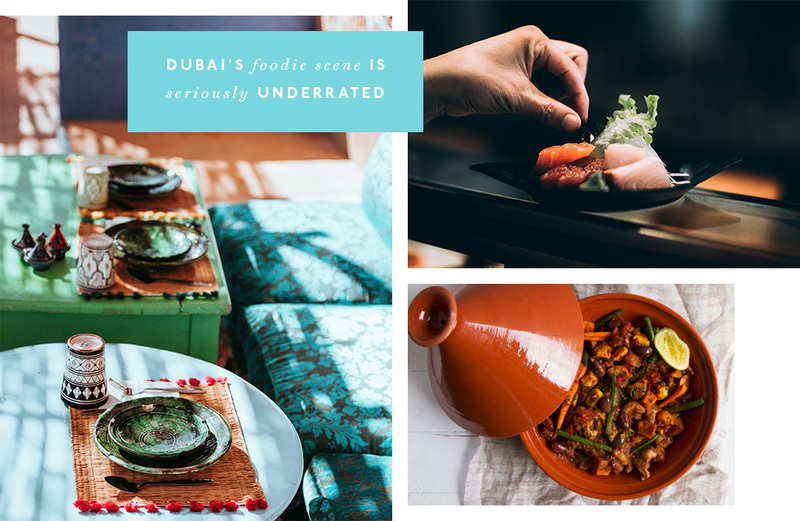 Dubai is a seriously underrated foodie hotspot—famous for everything from their Friday brunch scene to their cocktails. When you’re in town, make a bee-line for seriously cool Comptoir 102 for healthy food that tastes anything but, or head to Zuma for Japanese so delish you’ll want to move in, or, for the most Dubai experience ever, get your hungry self to Ossiano for seafood served in an IRL fish tank—yep, check out that view! If you really want to live it up on your stop-over, Nikki Beach will truly have you living your best (read: most extra) life. Or, for a drink and arguably one of the best views in Dubai, set up for the evening at Pure Sky Lounge & Dining. If a moody wine bar is more your vibe, we’d suggest making a beeline for Oscar’s Vine Society. Dubai Mall really is doing the most. There’s a 'uge Fountain Show, an ice rink, an indoor waterfall, an aquarium and underwater zoo, and then every single shop you could ever imagine. Leave at least a whole afternoon for exploring this one. Alserkal Avenue is one of the most overlooked must-dos in Dubai. Located in the Al Quoz industrial area, this is a whole neighbourhood dedicated to arts and culture. Expect a hub of architectural warehouses and public spaces that have been turned into ‘uge art installations just ripe for your exploring. A word of advice: don’t leave Dubai without checking out this gem. Dubai has beaches by the dozen, so you’re probably going to make a great choice even if you just close your eyes and pick! We love Kite Beach, Sunset Beach, La Mer…honestly, they’re all great! If you’ve done the hip eateries, cool bars, and art-dedicated ‘hoods, you should probably do yourself a favour and check out the rich history of Dubai. To do so, head to the city's historical neighbourhood, Al Fahidi to see the traditional architectural style (up until the 70s!). Who said learning wasn’t fun?! Look, don’t go to Dubai without checking out the world’s tallest building. Just don’t! The views are kind of ridiculous, and hey—where else are you going to ever see this!? Delete some pictures on your phone before you visit, because you’re going to be snapping up a storm. Euro summer, we’re coming for you! Book your trip to Europe via Dubai now with Flight Centre, thanks to Dubai Tourism and Emirates. Editor's note: this article was produced in partnership with Flight Centre, Dubai Tourism, and Emirates. Thank you for supporting the sponsors who make The Urban List possible. To read our editorial policy, click here.